February 12, 2017 (Millington, TN) The Memphis Rockin' Radial Series presented by FAST race one is a wrap and the event was no less than its name sake - it was Rockin'. In the series debut, we saw a nice car count, with an fan support that shows the series will be one to watch moving forward. The event kicked off with three rounds of qualifying followed by eliminations. With overcast skies early, the moisture stayed away and the race was able to get underway at 11 a.m. and wrap up in the early evening hours. The Memphis Rockin' Radial Series presented by FAST featured X275, MX235, Mean Street, PTC 6.0, Rick's Powder Coating 7.0 and 4.90 index as well as test session and the Memphis Street Outlaw Tryouts. 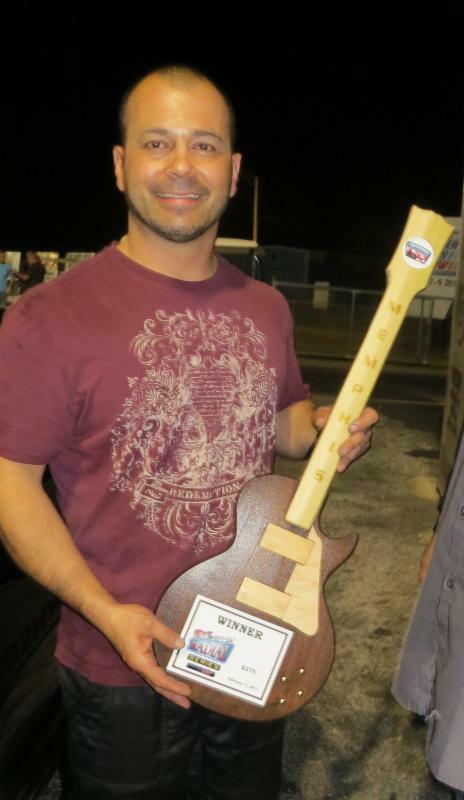 Racers were looking to take home the signature trophy of the Rockin' R adial Series presented by FAST. The handcrafted wooden, two-tone guitar. Each one individually produced and no two identical. This unique award along with the positive response will be one many racers will look to get their hands on in events to come. In the X275 class the finals saw Shane Fisher out of DeWitt, AR paired against Cecil Whitaker, the number one qualifier on the day, out of Dexter, MO. Whitaker would have the better reaction time giving it back on the top end. Fisher with a .140 reaction time running a 4.574 at 159.51 MPH over Whitaker's .074 reaction time running a 4.734 at 155.35 MPH. In MX235 the finals would see Dan Saitz of Fenton, MO paired against Corey Stephens of Wenzville, MO. Saitz, the number one qualifier would take it at the tree with a .081 reaction time running a 4.763 at 153.95 MPH to Stephens .09 reaction time, running a 4.827 at 144.38 MPH. Mean Street would start off with a little excitement as Don Duwe was on the bumper of his 1987 Ford Mustang and would land it hard in first round of eliminations. The final would bring Danny Finch of Searcy, AR to pair against Chad Moore of Campbell, MO. Finch the number one qualifier would have it on the tree and give it back on the top end. Moore takes the win with a .061 reaction time running a 5.219 at 127.08 MPH to Finch's .023 reaction time running a 5.434 at 125.52 MPH. Moving into the index classes, first up with the PTC 6.0. Jesse Bobo would be the number one qualifier and take it to the finals. The finals would see Jesse Bobo of Walnut, MS paired against Cliff Hubbard of Millington, TN. Hubbard taking the reaction time with Bobo chasing. Hubbard would take the win with a .019 reaction time running a 6.059 to Bobo's .055 reaction time with a breakout run of 5.986. In the Rick's Powder Coating 7.0 class, Millington native, Ron Minton would pair with Woody Privett of Alamo, TN. Privett the number two qualifier on the day would take the win with a .049 reaction time running a 7.077 to Minton's .192 reaction time breaking out with a 6.996. Rounding out the racing for the day is the 4.90 class. Jesse Rogers from Lebanon, TN would pair off with Michael Hall of Oliver Branch, MS. Hall would be too quick on the tree, giving the win to Rogers with a .011 reaction time running a 4.913 to Halls red .078 reaction time. 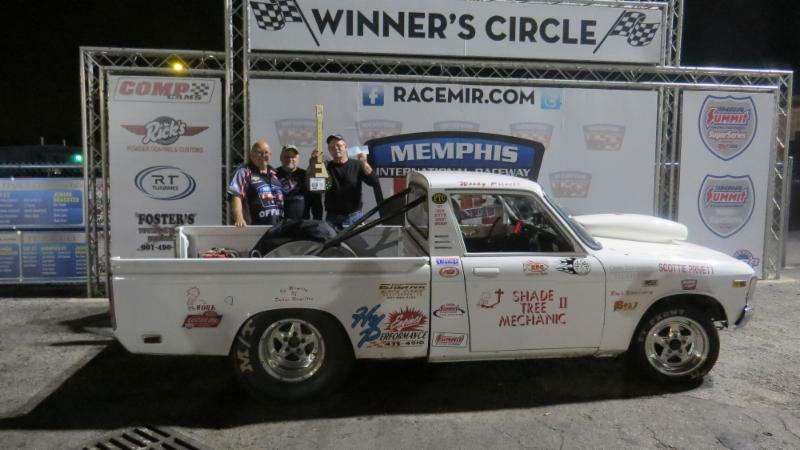 "It was a great first event, said Dominic Blasco, director of operations for Memphis International Raceway. "The car count was a little less than we would have liked to of seen, but all in all, it was a good day. The crew at Memphis will continue to strive to provide the best experience possible and with all opening days, we had our bumps in the road but still a good day." The Rockin' Radial Series presented by FAST will be back in action on May 5-6, 2017. Followed by a Radial vs the World appearance at Door Wars on June 23-24 with the season finale being held October 27-29, 2017. Up next on the schedule, is an open test n tune on Saturday, February 18 with gates opening at 11:30 a.m. and track going hot a noon until 4 p.m.; $25.00 to run and $10.00 for crew and spectators with children 12 and under free.